(Oregon Coast) – Yup, you can still see whales along the Oregon coast in spring, even after spring break. Yup, you may even spot killer whales. 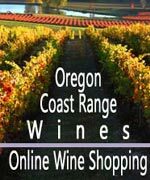 And yes – you may be surprised – a lot of lodgings are still doling out great deals in spring, especially if you're lucky enough to have spring vacation outside of the two big weeks of Oregon and Washington schools. 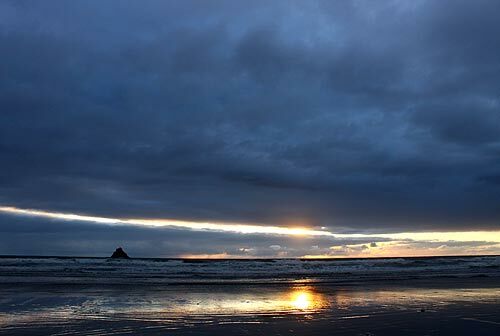 (Above: a startling spring sky in Arch Cape, near Cannon Beach). 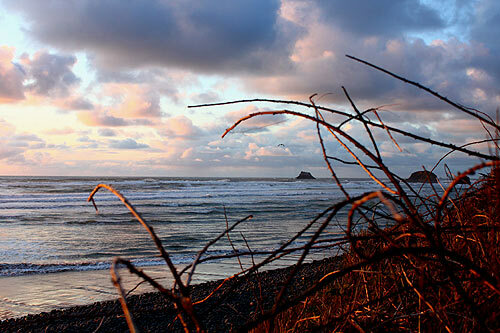 See spring break lodging advice for the Oregon Coast. Oh, you didn't know those things? Well, those aren't necessarily the real shockers anyway. Mother Nature has some rather hidden delights waiting in spring and spring break in the realms of weather, storms, beach finds, and how you photograph this area while visiting. 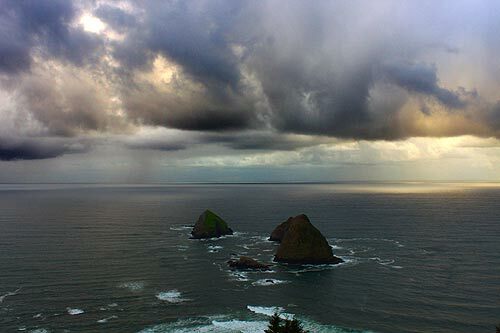 March and April bring a crazed kind of weather, often switching back and forth abruptly between sunny and squalls within the same day, sometimes within a half hour. You get an interesting mix of increasingly nice days, with occasional winter-like storms still possible – periodically within the same day. Those storms create some wild possibilities, especially when paired with the larger blooms of phytoplankton. You then get a better chance of seeing sea foam pulling all sorts of strange stunts, like moving across the highways or even flying upwards, creating the mind-boggling sight of what looks like snow going the wrong direction. Finding a lot of phytoplankton (foam) on beaches and in the waves is also a good sign you could see glowing sand at night. This happens more in April, but it can occur in spring break. This factoid also has to do with the following tidbit: how spring can be the most photogenic time of year on the Oregon coast. A little known fact about spring on the coast, especially April, is that this season can yield the best photographs of the whole year. This can begin in late March, though it usually really kicks into high gear in April and May. (Above: Oceanside). In spring, conditions are ripe for some of the most stunning sunsets and sky conditions during daylight. You'll find big, fat puffy clouds and quickly-rotating weather patterns that can create some remarkable colors and sights you may not find any other season. Colors can be more intense and the shapes in the sky downright jaw-dropping. It has to do with denser, wetter air and the way some clouds affect lighting. There's a big scientific explanation here and further examples. Another little known secret is that Japanese glass floats – now quite rare – will still show up periodically after the storms of February and March. However, you have to know what to look for along the beaches and the right conditions. It’s quite a skill. Unfortunately, this year has not been a very stormy one. So you're chances of finding them are not good this time around. But there's always next year. Also fun to look for: some of the year’s lowest tides can happen in March, April and May, with May having a tendency to be the lowest. 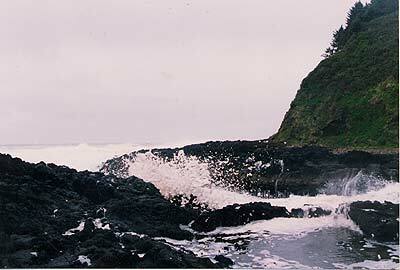 This allows greater exploration of tide pools and other sights not always visible.